Local cerebral hypoperfusion causes ischemic stroke while driving multiple cell-specific responses including inflammation, glutamate-induced neurotoxicity mediated via NMDAR, edema formation and angiogenesis. Despite the relevance of these pathophysiological mechanisms for disease progression and outcome, molecular determinants controlling the onset of these processes are only partially understood. 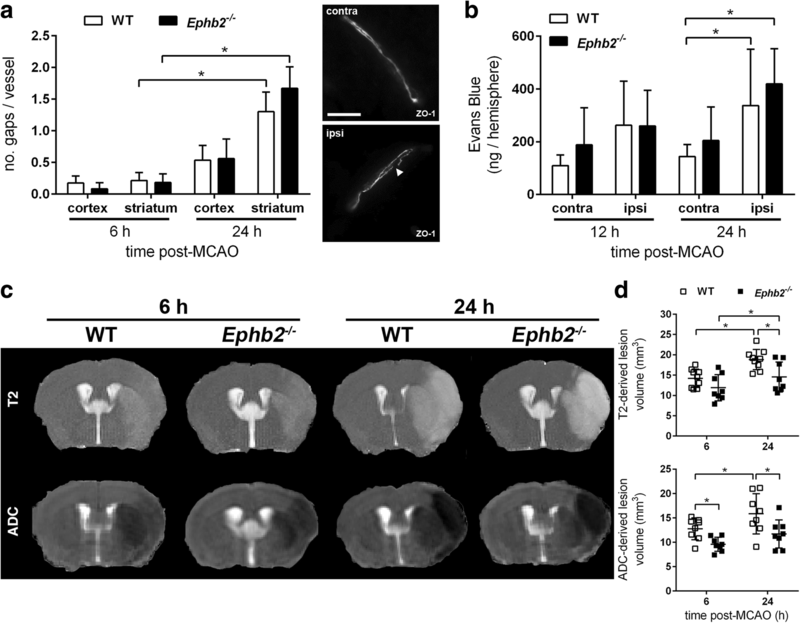 In this context, our study intended to investigate the functional role of EphB2, a receptor tyrosine kinase that is crucial for synapse function and binds to membrane-associated ephrin-B ligands. Cerebral ischemia was induced in Ephb2−/− mice by transient middle cerebral artery occlusion followed by different times (6, 12, 24 and 48 h) of reperfusion. Histological, neurofunctional and transcriptome analyses indicated an increase in EphB2 phosphorylation under these conditions and attenuated progression of stroke in Ephb2−/− mice. Moreover, while infiltration of microglia/macrophages and astrocytes into the peri-infarct region was not altered, expression of the pro-inflammatory mediators MCP-1 and IL-6 was decreased in these mice. In vitro analyses indicated that binding of EphB2 to astrocytic ephrin-B ligands stimulates NF-κB-mediated cytokine expression via the MAPK pathway. Further magnetic resonance imaging of the Ephb2−/− ischemic brain revealed a lower level of cytotoxic edema formation within 6 h upon onset of reperfusion. On the mechanistic level, absence of neuronal EphB2 decreased the mitochondrial Ca2+ load upon specific activation of NMDAR but not during synaptic activity. Furthermore, neuron-specific loss of ephrin-B2 reduced the extent of cerebral tissue damage in the acute phase of ischemic stroke. Collectively, EphB2 may promote the immediate response to an ischemia-reperfusion event in the central nervous system by (i) pro-inflammatory activation of astrocytes via ephrin-B-dependent signaling and (ii) amplification of NMDA-evoked neuronal excitotoxicity. Cerebral ischemia is one of the leading causes of death and disability in the Western world while effective therapeutic options such as thrombectomy and thrombolysis are limited to a small number of patients only. Therefore, unraveling pathophysiological mechanisms underlying ischemic stroke is needed to develop novel and adjuvant therapies. Ischemic stroke due to the occlusion of a main cerebral artery leads to a critical shortage of oxygen, glucose and further nutrients in the affected brain area. The latter initiates a complex cascade of detrimental events evolving within different temporal and spatial frames. This ischemic cascade encompasses initial bioenergetic failure and ionic imbalance, followed by excitotoxicity, oxidative stress, dysfunction of the blood-brain barrier (BBB), and inflammatory responses, which altogether lead to the progressive death of neurons, glial and endothelial cells . The bioenergetic failure, rapidly occurring due to the lack of oxygen and glucose, results in breakdown of the normal resting potential of neurons, depolarization, and massive glutamate release. Subsequent excessive stimulation of glutamatergic receptors, most notably extrasynaptic N-methyl-D-aspartate receptors (NMDARs), causes calcium overload and mitochondrial dysfunction, which trigger a range of downstream neurotoxic cascades that impair neuronal function or lead to cell death (glutamate excitotoxicity) [18, 47]. Unchecked influx of Na+, K+, and Ca2+ as a result of ischemia-related energy depletion and glutamate-mediated NMDAR overactivation, in turn, drives Cl− influx via chloride channels, and the resultant increase in intracellular osmolarity drives inflow of water leading to osmotic expansion of the cell (cytotoxic edema) . Cytotoxic edema represents a premorbid cellular process that almost inevitably leads to oncotic or necrotic cell death of mostly astrocytes and neurons . Cytotoxic edema also supplies the driving force for the delayed-onset vasogenic edema that is characterized by extravasation and accumulation of fluid in the cerebral parenchyma due to structural BBB disruption [30, 37, 48]. The BBB is a selective barrier formed by endothelial cells that line cerebral microvessels. Tight junctions (TJs) interconnecting adjacent endothelial cells restrict the movement of molecules and cells across the intact BBB. At the molecular level, TJs consist of specialized transmembrane proteins such as occludin and claudin-5 that are anchored to the actin cytoskeleton via the scaffolding protein Zonula occludens (ZO)-1 [24, 32, 46]. During ischemia-reperfusion (I/R) injury, disruption of regular localization along the cellular borders, increased proteolytic degradation, or reduced expression of TJ proteins occurs causing loss of junctional integrity, increased paracellular BBB permeability, and vasogenic edema formation, which is ultimately responsible for brain swelling in the course of ischemic stroke [24, 46]. As a consequence of neuronal cell death, resident immunocompetent cells of the central nervous system (CNS) such as microglia and astrocytes become rapidly activated. Early pro-inflammatory activation of glial and endothelial cells is accompanied by the release of cytokines, chemokines and reactive oxygen species (ROS) that contribute to the delayed recruitment and transmigration of peripheral immune cells such as neutrophils and monocytes across the disrupted BBB causing secondary brain damage . Taken together, the complex ischemic cascade involves specific spatiotemporal interactions of all parenchymal brain cells. Important determinants orchestrating cellular interactions in this context are the erythropoietin-producing human hepatocellular (Eph) receptors and their corresponding ligands (ephrins). The Eph receptors comprise a large family of receptor tyrosine kinases that not only have important roles in the establishment of neuronal and vascular networks during embryonic development, but also coordinate the homeostasis of the adult CNS and many other adult organs [23, 40, 57]. Their ligands are either attached to the cell surface through a glycosylphosphatidylinositol (GPI) linkage and preferentially bind EphA receptors (ephrin-A) or are transmembrane proteins that preferentially bind EphB receptors (ephrin-B). Interactions are promiscuous within each class, and some Eph receptors can also bind to ephrins of the other class. A distinctive feature of Eph-ephrin complexes is their ability to generate bidirectional signals that affect both the receptor-expressing (“forward” signaling) and ephrin-expressing cells (“reverse” signaling) [23, 40, 57]. There are several lines of evidence suggesting an important role of the EphB receptor/ephrin-B ligand system in stroke pathology. Firstly, in glutamatergic neurons, EphB2 receptors were shown to associate with NMDAR at synaptic sites, and their activation by ephrin-B ligands modulates NMDAR-driven Ca2+ influx . Secondly, bidirectional signaling between ephrin-B2 on reactive astrocytes and EphB2 on meningeal fibroblasts is an early important event during development of the glial scar in the adult CNS in response to injury . 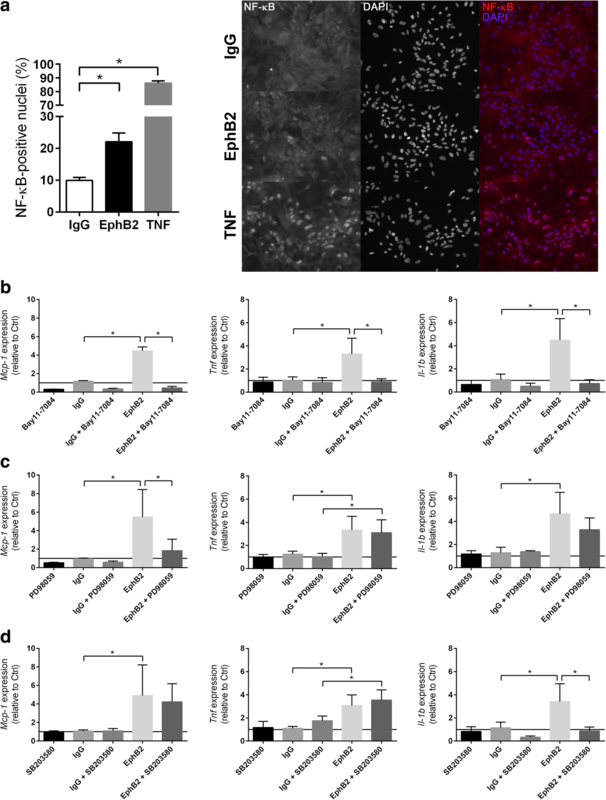 Thirdly, bidirectional signaling between monocytic EphB2 and endothelial cell ephrin-B1 and -B2 promotes adhesion, pro-inflammatory activation, and transmigration of monocytes, while it lowers the integrity of interendothelial cell junctions and provokes a pro-inflammatory phenotype in endothelial cells [5, 26, 31, 41]. In the light of those findings, our present study aimed to investigate the impact of EphB2 on the outcome of ischemic stroke and the responses of brain parenchymal cells. All mouse lines were established on a C57Bl/6 background. We used female and male littermate mice that were age-matched between experimental groups. Mice were between 6 and 10 weeks of age. All animal experiments were approved by the local animal welfare committee (Regierungspräsidium Karlsruhe, Germany, permission number: 35–9185.81/G-112/13), conformed to the Guide for the Care and Use of Laboratory Animals published by the US National Institutes of Health, and were performed in accordance with the recently published Animal Research: Reporting In Vivo Experiments (ARRIVE) guidelines (https://www.nc3rs.org.uk/arrive). All mice were housed at constant room temperature (22 ± 2 °C) and relative humidity (50–55%) on a controlled 12:12 h light-dark cycle, and were provided with standard laboratory chow (LASQCdiet Rod16; LASvendi, Soest, Germany) and water ad libitum. Mice homozygous for a null allele of Ephb2 (Ephb2tm1Paw; Ephb2−/−)  and corresponding wild-type (WT) littermates were obtained by mating Ephb2 haploinsufficient (Ephb2+/−) mice. Depletion of EphB2 protein was confirmed by capillary electrophoresis (Additional file 1: Figure S1a). Neural cell-specific ephrin-B2 deficient mice (nEfnb2Δ/Δ) were generated by crossing animals harboring two floxed alleles (exon 2 flanked by loxP sites) of the Efnb2 gene (B6.E14-TgH(efnb2flx/flx)RK; Efnb2fl/fl)  with transgenic mice expressing Cre recombinase under control of the promoter and the nervous system-specific enhancer present in the second intron of the rat nestin gene (B6.Cg-Tg(Nes-cre)1Kln) . Cre-mediated excision of floxed exon 2 in the Efnb2 gene was successfully verified on the mRNA level using real-time RT-PCR (Additional file 1: Figure S1b). Mice were genotyped using primers (Eurofins Genomics, Ebersberg, Germany) described in Additional file 2: Table S1. All mice were randomly allocated to experimental groups. Operators and investigators were blinded for mouse genotype in all experiments and analyses. Evaluation of all read-out parameters was done independently and in a blinded fashion. Mice were used at the age of 7–9 weeks. Female and male mice were anesthetized by a mixture of 2% isoflurane in, 70% N2O and remainder O2, and were maintained by reducing the isoflurane concentration to 1.0–1.5%. To induce focal cerebral ischemia, a 7–0 silicon rubber-coated nylon monofilament (Doccol Corporation, Redlands, USA) was introduced in the left internal carotid artery and pushed toward the left middle cerebral artery (MCA) as previously described . In subgroups of mice laser-Doppler flowmetry (LDF) was used to confirm successful MCA occlusion (MCAO) as reported previously . The intraluminal suture was left for 60 min. Subsequently, animals were re-anesthetized and the occluding monofilament was withdrawn to allow reperfusion for 6–72 h. For sham surgery, the mice underwent the same procedure without vessel occlusion. The animals were maintained at 37 °C during and after surgery until they were fully recovered from anesthesia. Then, mice were returned to their solitary cages in a heated (30 °C) environment with free access to food and water for 12 h. During the remaining time animals were kept under normal conditions as described above. Additional file 2: Table S2 lists the criteria resulting in exclusion from end-point analysis. Motor coordination and balance were assessed by using the Rotarod performance test. Mice were placed individually on the revolving drum. Once they were balanced, the drum was accelerated from 4 to 40 rpm over the course of 300 s, and the time at which the animal dropped off the drum was determined (maximum testing time 300 s). Mice were trained for three consecutive days (three runs each) and were tested directly before MCAO and 24 h after onset of reperfusion. At indicated time points, neurological function was additionally evaluated using the modified Bederson neurological deficit score, according to the following scoring system: 0, no observable deficit; 1, forelimb flexion; 2, decreased resistance to lateral push; 3, unidirectional circling; 4, no movement . MRI was performed on a dedicated small animal scanner with 9.4 Tesla magnetic field strength (BioSpec 94/20 USR, Bruker, Ettlingen, Germany) using a volume coil for RF transmission and a 4-channel phased-array surface receiver coil. An isoflurane evaporator connected to a supply of compressed air was used for anesthesia. Anesthesia was induced at 2% isoflurane and maintained with 1–1.5%. Animals were placed in prone and fixed positions on an animal holder equipped with a headlock and tooth bar to minimize head motion. Body temperature was maintained using a temperature-controlled heating pad. Respiration was monitored externally with an in-house developed program in LabView (National Instruments Corporation, Austin, Texas, USA). The imaging protocol included T2-weighted imaging (TEeff/TR = 66 ms/2650 ms, RARE factor = 8, slice thickness 0.5 mm, 13 slices, matrix 256 × 256, in plane resolution 78 × 78 μm), diffusion-weighted imaging (TEeff/TR = 20 ms/3400 ms, slice thickness 0.7 mm, one measurement with b = 0 and 30 diffusion sensitized directions with a b-value of 1500 s/mm2, field-of-view 12 × 15 mm, matrix 96 × 128, resolution 125 × 117 μm), as well as quantitative T2 measurements (TE increments of 8 ms from 8 ms to 136 ms, TR = 3100 ms, slice thickness 0.5 mm, matrix 172 × 172, resolution 116 × 116 μm). The real signal component from the Multislice Multiple Spin Echo data were fitted after phase correction and SNR optimized multiple coils signal combination on a voxel-by-voxel basis with the monoexponential function S0*e –(TE/T2) using a nonlinear least-squares fit procedure (MATLAB Release 2012b, The MathWorks, Inc., Natick, Massachusetts, United States). S0 is the signal at TE = 0. Apparent diffusion coefficient (ADC) values were obtained from diffusion-weighted images by FSL’s (FMRIB [The Oxford Centre for Functional Magnetic Resonance Imaging of the Brain] Software Library) FDT toolbox (https://fsl.fmrib.ox.ac.uk/fsl/fslwiki/FDT). Image analysis was performed with the software Amira (Visage Imaging, Inc., San Diego, USA). The ischemic lesion on ADC and T2 maps in basal ganglia and cortex was determined by manual region growing using threshold-based pre-segmentation. Animals were deeply anesthetized and transcardially perfused with PBS (2 ml/min) for 5 min. Brains were removed and embedded into Tissue-Tek (Sakura Finetek, Staufen, Germany). From each brain, 24 coronal sections (10 μm thickness, 0.4 mm distance) were prepared using a Leica CM1520 cryostat (Leica Biosystems, Wetzlar, Germany) at a constant temperature of − 15 °C, and stained with cresyl violet (Merck Millipore, Darmstadt, Germany, #105235) according to the manufacturer’s instructions. Stained brain slices were digitized, and infarct and edema volume was measured using the image analysis software ImageJ (National Institutes of Health, Bethesda, MD, USA) as described previously [29, 43]. Fluoro-Jade C (FJC) staining of cerebral cryosections (10 μm thickness; + 0.62 to − 0.62 mm relative to Bregma) was used to detect neuronal degeneration following the protocol of manufacturer (Merck Millipore, #AG325). FJC staining was recorded using a Zeiss Axiovert 200 M microscope (Carl Zeiss Microscopy, Göttingen, Germany) with a Hamamatsu ORCA flash 4.0 camera (Hamamatsu Photonics, Herrsching am Ammersee, Germany) by applying TissueFAXS scanning software (TissueGnostics, Vienna, Austria). Nuclei were identified by DAPI staining. Cells showing fluorescent signal for FJC were automatically counted by using TissueQuest 4.0 software (TissueGnostics). Gross anatomical features of the cerebrovascular architecture were determined as described previously . Mice were anesthetized 2 h prior to the end of the reperfusion time, and 100 μl of a pre-warmed (37 °C) solution containing 2% Evans Blue (Sigma-Aldrich, Steinheim, Germany) in 0.9% NaCl were injected into the tail vein. Mice were transcardially perfused, brains harvested and separated into entire left and right hemispheres. Each hemisphere was suspended in 500 μl ice-cold 50% trichloroacetic acid and homogenized with a grinding ball at 30 Hz for 2 min (Mixer Mill MM301; Retsch, Haan, Germany). Tissue lysates were then incubated for 2 h at 4 °C and centrifuged at 16,000×g for 15 min at 4 °C. Evans Blue in the supernatant was measured using a spectrophotometer (Synergy HT; BioTek, Bad Friedrichshall, Germany) at 610 nm and quantified according to a standard curve. Primary astroglial and microglial cultures were prepared from neonatal WT, Ephb2−/− and nEfnb2Δ/Δ mice (P0-P2). The purity of astrocyte and microglia cultures was about 96% and almost 100%, respectively (Additional file 1: Figure S1c). Details on isolation, culture, treatment, and analysis of microglial phagocytosis are provided in the Supplementary Methods (Additional file 3). Primary dissociated cortical cultures were prepared from newborn WT and Ephb2−/− mice (P0). The relative portion of neurons within the mixed cultures was about 83% (Additional file 1: Figure S1c). Detailed experimental procedures for isolation, culture, and treatment of neuronal cultures as well as analysis of mitochondrial/cytoplasmic Ca2+ concentration and mitochondrial membrane potential can be found in the Supplementary Methods (Additional file 3). Immunofluorescence staining techniques were applied to determine abundance and subcellular localization of certain proteins and were used to identify different cell types in brain tissue sections and cellular monolayers by detection of cell-specific marker proteins. A detailed description is given in the Supplementary Methods (Additional file 3; see also Additional file 2: Table S3). Mice were transcardially perfused with PBS, brains harvested, and a 2-mm-thick tissue slice (− 1.0 to − 3.0 mm relative to bregma) was prepared from each brain and separated into the left and right hemispheres. Total RNA from brain tissue samples or cells was isolated using the TRI reagent (Thermo Fisher Scientific, Dreieich, Germany) according to manufacturer’s instructions. For digestion of residual DNA, 10 μg of total RNA was incubated in a 25 μl reaction mix containing 1x DNase-buffer, 40 U RNasin and 1 U DNase (Promega, Mannheim, Germany) for 30 min at 37 °C. Subsequently, cDNA was synthesized using the Access Reverse Transcription PCR Kit (Promega, #A1260) and quantitative real-time PCR for the target sequences was performed in the Rotor-Gene Q (Qiagen, Hilden, Germany) using the QuantiTect SYBR Green PCR Kit (Qiagen). Fluorescence was monitored (excitation at 470 nm and emission at 530 nm) at the end of the annealing phase. Threshold cycle (Ct) was set within the exponential phase of the PCR. Quantification of the PCR product was done by using the ΔΔCt method. Amplification of the 40S ribosomal protein S12 (Rps12) cDNA served as an internal standard. Primers were purchased from Eurofins Genomics (for primer sequences, see Additional file 2: Table S4). Mice were transcardially perfused with PBS, brains extracted, and separated into the left and right hemispheres. Total RNA from brain tissue samples was prepared using the TRI reagent (Thermo Fisher Scientific) according to manufacturer’s instructions followed by additional purification utilizing the RNeasy Mini Kit (Qiagen). RNA was tested by capillary electrophoresis on an Agilent 2100 bioanalyzer (Agilent, Waldbronn, Germany) and high quality was confirmed. Gene expression profiling was performed using arrays of mouse MoGene-2_0-st-type from Affymetrix (Santa Clara, USA). Biotinylated antisense cRNA was then prepared according to the Affymetrix standard labeling protocol with the GeneChip® WT Plus Reagent Kit and the GeneChip® Hybridization, Wash and Stain Kit (both from Affymetrix). Afterwards, hybridization on the chip was performed on a GeneChip Hybridization oven 640, then dyed in the GeneChip Fluidics Station 450 and thereafter scanned with a GeneChip Scanner 3000. All equipment used was from Affymetrix (High Wycombe, UK). A Custom CDF Version 20 with ENTREZ-based gene definitions was used to annotate the arrays . The Raw fluorescence intensity values were normalized by applying quantile normalization and RMA background correction. An ANOVA was performed to identify differentially expressed genes using a commercial software package (SAS JMP10 Genomics, version 7) from SAS (SAS Institute, Cary, NC, USA). A false positive rate of a = 0.05 with FDR correction was taken as the level of significance. Gene Set Enrichment Analysis (GSEA) was used to determine whether defined sets of genes exhibited a statistically significant bias in their distribution within a ranked gene list using the software GSEA . Pathways belonging to various cell functions such as cell cycle or apoptosis were obtained from public external databases (KEGG, http://www.genome.jp/kegg). The raw and normalized data are deposited in the Gene Expression Omnibus database (http://www.ncbi.nlm.nih.gov/geo/; accession No. GSE120565). Mice were transcardially perfused with PBS, brains removed, and a 3-mm-thick tissue slice (+ 2.50 ± 0.5 to 0.00 ± 0.5 mm relative to bregma) was prepared from each brain and separated into the left and right hemispheres. The relative level of tyrosine phosphorylation of 39 different receptor tyrosine kinases (RTK) was determined in brain tissue samples using the Proteome Profiler Mouse Phospho-RTK Array Kit (R&D Systems, Wiesbaden, Germany, #ARY014) according to manufacturer’s instructions. Briefly, 500 μl lysis buffer was added to each brain tissue slice, and tissue samples were homogenized mechanically as described above. Following incubation on ice for 10 min, tissue homogenates were centrifuged for 5 min at 16,100×g at 4 °C. Protein concentration in the supernatant was then quantified by Bradford assay, and 250 μg protein/sample was processed further following the protocol of manufacturer. Mice were transcardially perfused with PBS, brains harvested, and a 2-mm-thick tissue slice (+ 3.0 to + 1.0 mm relative to bregma) was prepared from each brain and separated into the left and right hemispheres. Lysis buffer containing 20 mM Tris (pH 7.6), 250 mM NaCl, 1 mM EDTA, 1 mM EGTA, 1% Triton X-100, 0.5% Nonidet P-40, 1 mM DTT, 1 mM PMSF, and 1% protease inhibitor cocktail (all from Sigma-Aldrich) was added to brain tissue samples or cell monolayer. Tissue samples were homogenized mechanically as reported above. Following incubation on ice for 15 min, tissue and cell homogenates were centrifuged for 15 min at 16,100×g at 4 °C. Protein concentration in the supernatant was then quantified by Bradford assay. Analysis of protein expression was performed according to the Wes User Guide using a Wes instrument from ProteinSimple (San Jose, CA, USA). Briefly, protein samples were diluted with 0.1X sample buffer to a final concentration of 0.5 μg/μl, and were mixed with fluorescent 5x Master Mix and incubated at 95 °C for 5 min. The samples were loaded into the Wes microplate along with a biotinylated protein ladder, blocking reagent, primary antibodies against EphB2 (R&D Systems, #AF467; 1:10) and beta-tubulin (Abcam, Cambridge, UK, #ab6046; 1:500), HRP-conjugated anti-rabbit secondary antibody, luminol peroxide, and washing buffer. The plates and capillary cartridges were loaded into the Wes for electrophoresis and chemiluminescence immunodetection using a CCD camera with default settings: electrophoresis, 375 V, 30 min; blocking, 5 min; primary antibody, 30 min; secondary antibody, 30 min; and camera exposure times, 1 s to 32 s. Compass software (ProteinSimple) was used to acquire and analyze the data and to generate gel images and chemiluminescence signal intensity values. Protein expression is calculated as the chemiluminescence intensity area under the curve. MCP-1 and TNF protein levels in cell supernatants were measured by quantitative ELISA (R&D Systems, Mouse MCP-1 DuoSet ELISA #DY479–05, Mouse TNF-alpha DuoSet ELISA #DY410–05) according to manufacturer’s instructions. If not indicated otherwise, all results are expressed as means and displayed on scattered dot plots ± standard deviation (SD). Differences between 2 independent experimental groups were analyzed by two-tailed Student’s t tests (normally distributed data) or Mann-Whitney U rank-sum tests (ordinal and non-normal data). Differences of one parameter among three or more independent experimental groups were analyzed by either one-way ANOVA followed by a Holm-Sidak’s multiple comparisons test (normally distributed data), or by Kruskal-Wallis H test with Dunn’s post hoc test (ordinal and non-normal data). Differences of two parameters among two or more independent/correlated experimental groups were analyzed by two-way (Repeated Measures) ANOVA followed by a Holm-Sidak’s multiple comparisons test (normally distributed data). A probability value of P < 0.05 was considered statistically significant. Data plotting and statistical analyses were done with Prism 6 (GraphPad Software, La Jolla, CA, USA). Cerebral ischemia disrupts regular receptor-ligand interactions due to loss of cellular integrity. To investigate whether the spatiotemporal distribution of the ephrin-B/EphB family members is affected under these conditions, we applied immunofluorescence-based analyses. The results indicate a homogenous distribution of ephrin-B1, ephrin-B2 and EphB2 protein across the hemisphere of coronal mouse brain sections, while EphB4 was primarily localized in close proximity to cerebral blood vessels (Fig. 1a). Acute focal ischemic stroke resulted in progressive loss of all ephrin-B/EphB proteins exept EphB4 within both the ipsilesional striatum and adjacent cortical tissue representing the infarct core and ischemic penumbra, respectively (Fig. 1a). Global analysis of receptor tyrosine kinase (RTK) phosphorylation using an antibody array in mice subjected to 60 min of MCAO followed by 6 h reperfusion revealed significantly increased phosphorylation of certain EphB receptor family members including EphB2 within the left ipsilesional cerebral hemisphere (Fig. 1b; phosphorylation status of 39 different murine RTK analyzed post stroke is shown in Additional file 1: Figure S2a) while total EphB2 protein amount did not differ between contra- and ipsilateral brain tissue (Additional file 1: Figure S1a). To further analyze the role of EphB2, mice homozygous for a null allele of Ephb2 (Ephb2−/−) were subjected to I/R injury. While EphB2 was not detectable (Fig. 1a; Additional file 1: Figure S1a), the spatial distribution of ephrin-B1, ephrin-B2, and EphB4 in both ischemic and non-ischemic areas of the mouse brain was not markedly different from WT littermates (Fig. 1a). However, Ephb2−/− mice showed markedly reduced neuronal cell death across the infarct lesion during the hyperacute phase of ischemic stroke (Fig. 1c). Global infarct lesion volume and brain swelling due to vasogenic/cytotoxic edema determined 12, 24 and 48 h upon onset of reperfusion were significantly diminished in Ephb2−/− mice as compared to WT littermates (Fig. 1d). Decreased brain tissue damage in Ephb2−/− mice was further associated with reduced Bederson neurological severity scores (Fig. 1e) and improved motor dysfunction (Fig. 1f) during the acute stage of ischemic stroke. Interestingly, when compared to WT littermates, also Ephb2 haploinsufficient (Ephb2+/−) mice developed less severe histologic injury and functional impairment after acute cerebral ischemia, albeit not to the same extent as observed in Ephb2−/− mice (Additional file 1: Figure S2b-d). Collectively, our findings suggest that EphB2 promotes brain tissue from damage during early acute stroke in a gene dosage-dependent manner. We conducted DNA microarray and subsequent gene set enrichment analyses (GSEA) to compare the genome-wide transcriptomic response to acute ischemic stroke in cerebral tissue of Ephb2−/− and WT mice. Among others, GSEA identified four gene sets linked to cell death that were significantly down-regulated in the ipsilateral brain hemisphere of Ephb2−/− compared to WT mice (Table 1, Fig. 2; Additional file 2: Table S5). 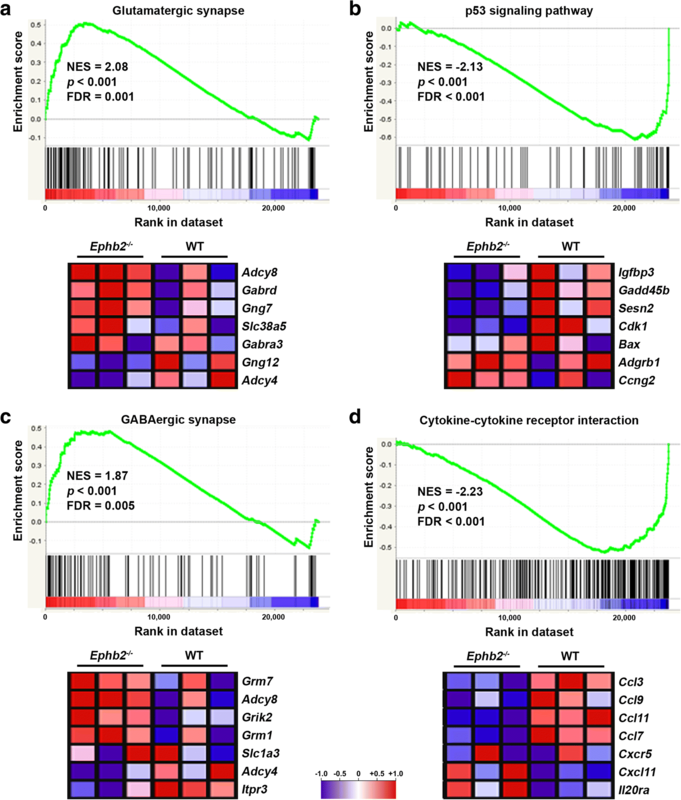 Moreover, twelve gene sets involved in inflammation and immune cell signaling were found to be significantly down-regulated in Ephb2−/− versus WT littermates (Table 1, Fig. 2; Additional file 2: Table S5). Six gene sets associated with synaptic function were up-regulated in the infarcted brain of Ephb2−/− in comparison to WT animals (Table 1, Fig. 2; Additional file 2: Table S5). Overall, these data suggest that EphB2-dependent signaling regulates processes determining the extent of infarction during acute ischemic stroke such as (1) cellular viability, (2) post-ischemic inflammation, and (3) synaptic function. In order to unravel cellular/molecular mechanisms underlying the aforementioned findings in Ephb2-deficient mice after acute ischemic stroke, we first investigated a possible vascular mechanism, as a significant proportion of double-mutant mice deficient in both EphB2 and EphB3 receptor exhibit defects in the remodeling of the embryonic vascular system . Perfusion of the arterial system through the left ventricle of the heart using colored particles that cannot pass the capillary system showed a similar gross anatomy of the circle of Willis at the base of the brain from Ephb2−/− mice versus WT littermates (Additional file 1: Figure S3a). The average number of surface arterial branches that originate from the proximal MCA was also similar between Ephb2−/− and WT animals (Additional file 1: Figure S3a). Cerebral perfusion monitoring revealed that proximal MCAO resulted in an average reduction of regional cerebral blood flow (rCBF) by 85 ± 6% in WT and 83 ± 7% in Ephb2−/− mice (Additional file 1: Figure S3b). Moreover, neither the density of cerebral microvessels nor the pericyte coverage of the microvasculature was significantly affected due to ablation of the Ephb2 gene (Additional file 1: Figure S3c, d). These findings confirm successful arterial occlusion in both genotypes, and exclude the possibility that lack of EphB2 increases the number or diameter of pial collaterals and/or leptomeningeal arteriole–arteriole anastomoses interconnecting distal branches of the MCA, anterior cerebral artery (ACA), and posterior cerebral artery (PCA) trees, which could partially compensate for disturbed blood flow after arterial occlusion . Our morphovolumetric analyses shown in Fig. 1e revealed reduced brain swelling in Ephb2−/− mice suffering from acute ischemic stroke. To address a possible role of BBB damage, we analyzed endothelial TJ structures. Our histological analyses disclosed a rearrangement of ZO-1 resulting in progressive gap formation at the endothelial cell membrane of blood vessels located in the ipsilesional cortex and striatum, which, however, was fairly comparable between Ephb2−/− and WT mice (Fig. 3a). In line with the progressive structural damage of the BBB after restoration of cerebral blood flow, the amount of Evans blue (EB), an intravenously administered intravital dye that binds to plasma albumin, extravasated into the brain parenchyma was markedly increased in ipsilesional as compared to contralateral brain tissue (Fig. 3b). The post-ischemic BBB leakage of EB upon 12 and 24 h of reperfusion was not significantly different between Ephb2−/− and WT animals (Fig. 3b), suggesting that lack of EphB2 has no relevant direct influence on the BBB hyperpermeability during acute ischemic stroke. In addition to these post-mortem examinations, we utilized multimodal, high-field (9.4 T) in vivo MRI for longitudinal evaluation to assess both vasogenic and cytotoxic edema formation in the brain during the acute phase of stroke using T2 relaxometry and diffusion-weighted imaging, respectively. Apparent diffusion coefficient (ADC) infarct volume (as determined by diffusion-weighted imaging) in the basal ganglia of Ephb2−/− mice was significantly lower at 6 h after reperfusion compared to WT mice while no volume differences were seen on T2 maps between both groups, suggesting that less cytotoxic edema evolves in Ephb2−/− mice during early time points after reperfusion (Fig. 3c, d). From 6 to 24 h after reperfusion the ADC and T2 infarct volume increased in both groups but to a significantly lesser degree in Ephb2−/− mice (Fig. 3c, d). Altogether, our observations suggest that lack of EphB2 has no effect on basal or infarct-triggered loss of BBB function but may indirectly attenuate stroke-associated brain swelling by reducing early cytotoxic edema, which in turn limits vasogenic edema formation. Gene set enrichment analyses on our whole genome expression data revealed a down-regulation of gene sets associated with inflammation and immune cell functions in the infarcted cerebral tissue of Ephb2−/− mice (Table 1, Fig. 2). Given that brain tissue protection in Ephb2−/− mice is already detectable during the first 6 h of a stroke, we reasoned that EphB2-dependent signaling might be involved in immediate early post-ischemic pro-inflammatory processes. Immunofluorescence techniques revealed an increasing number of neutrophils infiltrating the ipsilateral hemisphere from 6 to 24 h upon onset of reperfusion, whereas the frequency of neutrophils located at the non-affected brain hemisphere remained unchanged as compared to sham-operated animals (Fig. 4a; Additional file 1: Figure S4). The early post-ischemic recruitment of neutrophils into the brain of Ephb2−/− mice was not significantly different from WT mice (Fig. 4a). In response to an ischemic insult, resident microglia and astrocytes localized in close vicinity to the infarct lesion site undergo cellular activation that causes morphological and immunophenotypic changes, enhanced proliferation, and increased production and release of cytokines, chemokines, and ROS . Accordingly, as compared to sham-operated control animals, the number of both microglia/macrophages (Fig. 4b; Additional file 1: Figure S4) and astrocytes (Fig. 4c; Additional file 1: Figure S4) within the peri-infarct region gradually increased from 24 to 72 h post-reperfusion, but the quantities of microglia/macrophages and astrocytes across the peri-infarct zone of Ephb2−/− mice were quite similar to those in WT littermates (Fig. 4b, c). Unfortunately, Iba1 did not allow distinguishing activated from resting microglia. At 12 h post-reperfusion, prior to any substantial accumulation of activated glial cells along the infarct border zone, we determined a markedly increased expression of key pro-inflammatory factors such as Mcp-1, Il-1beta, Il-6, and Cox-2, which was significantly less pronounced in the ipsilesional brain tissue of Ephb2−/− mice in comparison to WT animals (Fig. 4d). The above-mentioned results prompted us to study the role of EphB2/ephrin-B signaling in the inflammatory activation of microglia and astrocytes. Primary murine microglia, which were isolated from cortices of WT mice and exposed to either oxygen-glucose deprivation (OGD) or basal conditions in vitro, responded to stimulation with pre-clustered recombinant EphB2/Fc fusion proteins with a transcriptional up-regulation of Tnf, whereas the expression of Mcp-1 and Il-1beta remained unchanged (Fig. 5a). On the contrary, the treatment with pre-clustered ephrin-B1 and ephrin-B2, two ligands of EphB2, did not affect inflammatory factor expression of non-stressed microglia (Additional file 1: Figure S5a). In microglia faced with OGD stress, ephrin-B2 increased the expression of Il-1beta (Additional file 1: Figure S5a). The phagocytic activity of both OGD- and non-stressed microglia was not altered by either EphB2, ephrin-B1 or ephrin-B2 (Additional file 1: Figure S5b). To further clarify the impact of EphB2/ephrin-B forward signaling on microglial activation, microglia isolated from the cortices of Ephb2−/− mice were treated with ephrin-B1 or ephrin-B2. Neither the phagocytic activity nor the expression of pro-inflammatory factors of Ephb2−/− microglial cells exposed to ischemic or control conditions were markedly affected upon treatment with ephrin-B1 or ephrin-B2 (Additional file 1: Figure S5a, b). Overall, our results do not point to an important role of EphB2/ephrin-B forward or reverse signaling for the activation of resident microglia during early acute ischemic stroke. Primary murine astrocytes isolated from brain tissue of WT mice showed significantly increased mRNA levels of Mcp-1, Tnf and Il-1beta upon treatment with EphB2 (reverse signaling, Fig. 5b). A pro-inflammatory response to EphB2, albeit to a lesser extent, was also observed in astrocytes subjected to OGD (Fig. 5b). Astrocytic up-regulation of MCP-1 and TNF upon EphB2 treatment was further confirmed at the protein level (Fig. 5b). By contrast, ephrin-B1- or ephrin-B2-induced forward signaling did not elevate inflammatory factor expression of either OGD- or non-stressed astrocytes (Additional file 1: Figure S5c). In Ephb2−/− astrocytes (Additional file 1: Figure S6a) cultured under basal conditions, ephrin-B2, but not ephrin-B1, reduced the expression of Mcp-1, Tnf, and Il-1beta. However, the anti-inflammatory transcriptional response towards ephrin-B2 was not detectable in Ephb2−/− astrocytes subjected to OGD (Additional file 1: Figure S5c). Next, we investigated whether EphB2-induced reverse signaling is mediated via the activation of astrocytic ephrin-B1, ephrin-B2 or both. EphB2 treatment of non-stressed cortical astrocytes isolated from transgenic mice having a deficiency for the Efnb2 gene in cells of the neural lineage (Additional file 1: Figure S6b) failed to up-regulate Tnf and Il-1beta, while transcription of Mcp-1 was still significantly increased, albeit to a lesser extent as compared to WT astrocytes (Fig. 5b). Exposure to OGD stress enhanced the responsiveness of Efnb2−/− astrocytes for EphB2 and resulted in significant up-regulation of Mcp-1 and Tnf (Fig. 5b). Thus, our findings suggest that EphB2-induced reverse signaling through both ephrin-B1 and ephrin-B2 drives the pro-inflammatory activation of astrocytes. In an attempt to unravel the molecular basis underlying the EphB2-mediated inflammatory activation of astrocytes, we demonstrated that EphB2 favors the nuclear translocation of NF-κB, well known to promote the expression of pro-inflammatory factors at the transcriptional level (Fig. 6a). Accordingly, pre-treatment with BAY 11–7082, a potent inhibitor of the IκB kinase (key upstream regulator of NF-κB), completely prevented the EphB2-induced up-regulation of Mcp-1, Tnf, and Il-1beta (Fig. 6b). Moreover, pharmacological inhibition of mitogen-activated protein kinase kinase 1 and 2 (MAP2K1/2), which phosphorylates extracellular-signal-regulated kinase 1 and 2 (ERK1/2) and p38 MAPK, prior to EphB2 stimulation prevented transcriptional up-regulation of Mcp-1 (Fig. 6c) and Il-1beta (Fig. 6d), respectively. In contrast, inhibition of Src-family kinases (Additional file 1: Figure S7a), c-Jun N-terminal kinase (JNK; Additional file 1: Figure S7b) or phosphoinositide 3-kinase (PI3K; Additional file 1: Figure S7c), which have also been described as downstream targets of phosphorylated ephrin-B1 or -B2 and activators of NF-κB, did not impede EphB2-induced up-regulation of either Mcp-1, Tnf, or Il-1beta (Additional file 1: Figure S7a-c). We further analyzed whether ischemic stress conditions affect the expression of ephrin-B1 and ephrin-B2 in glial cells, and thus might alter their responsiveness toward EphB2. Indeed, exposure of microglia and astrocytes to ischemic or pure hypoxic conditions significantly increased the mRNA expression of Efnb2, while the transcript levels of Efnb1 and Ephb2 remained unchanged as compared to control conditions (Additional file 1: Figure S8a). Given that reduction of the cellular oxygen level was sufficient to up-regulate glial ephrin-B2, we investigated the possibility that Efnb2 is transcriptionally regulated through hypoxia-inducible factor (HIF). Cells were treated with dimethyloxallyl glycine (DMOG), an inhibitor of the prolyl 4-hydroxylase domain proteins (PHD), which act as key suppressors of the HIF pathway. 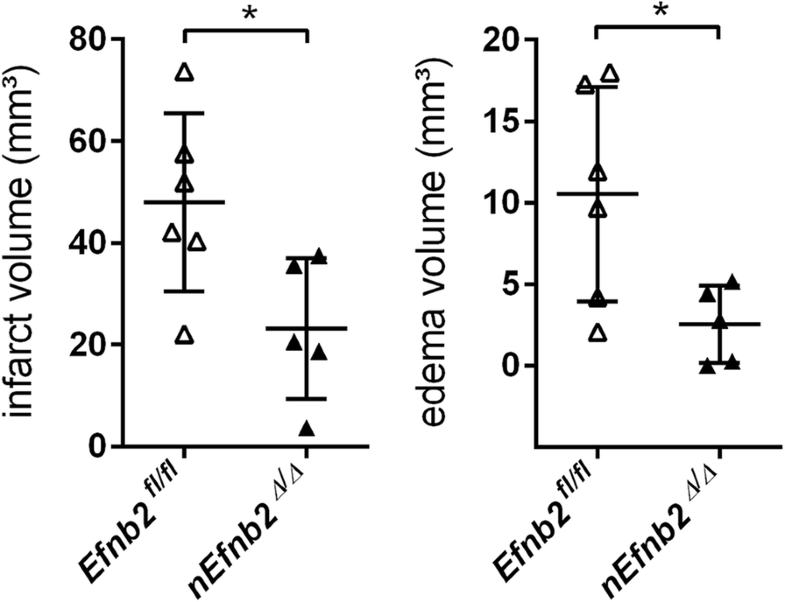 While astrocytes responded to DMOG with a strong up-regulation of the classical HIF target gene Vegfa, the mRNA levels of Efnb2 remained stable over time (Additional file 1: Figure S8b). The latter suggests that the PHD-HIF axis is not responsible for the oxygen-dependent Efnb2 gene expression. However, in ipsilesional brain tissue of mice subjected to I/R injury, neither Efnb2 nor Efnb1 or Ephb2 were found to be differently expressed compared to levels measured in cerebral tissue from sham-treated animals (Additional file 1: Figure S8c). Collectively, our results indicate that EphB2-mediated activation of both ephrin-B1 and ephrin-B2 promotes the NF-κB-dependent pro-inflammatory activation of astrocytes, but not microglia, through activation of MAPK signaling. Excessive release of glutamate into the extracellular space and subsequent overactivation of NMDARs is a crucial step in the ischemic cascade . Given the reduced neuronal cell death and extent of acute cytotoxic edema in Ephb2-deficient mice (Figs. 1c, 3c, d) upon ischemic stroke, we hypothesized that in this context EphB2 activation (Fig. 1b) contributes to neuronal excitotoxicity. In light of the importance of NMDAR-mediated excitotoxicity during cerebral ischemia , we consequently aimed at analyzing the function of NMDARs in EphB2-deficient neurons in the context of excitotoxicity. To this end, primary cortical cultures, consisting of > 80% neurons, were isolated from brains of newborn (P0) WT and Ephb2−/− mice, and cultured for ten days in vitro (DIV10) to achieve the development of an extensive network of synaptic contacts , and proper susceptibility to NMDA-induced excitotoxicity . Along with this, we confirmed that DIV10 neurons express EphB2 protein on the cell surface (Additional file 1: Figure S9). Cytoplasmic and mitochondrial Ca2+ levels, as well as changes in mitochondrial membrane potential, were evaluated before and during NMDAR stimulation. In order to prevent action potentials (APs) and associated Ca2+ signals not mediated through NMDAR activation, neurons were treated with drugs, which inhibit voltage-dependent Ca2+ channels, AMPA receptors (AMPARs), and voltage-dependent sodium channels. Those treatments already caused a decrease of baseline mitochondrial Ca2+ levels, assessed as a decrease in the baseline 4mt.D3cpv FRET ratio, in Ephb2−/− neurons. Further, the NMDA-triggered increase in mitochondrial Ca2+ levels was significantly reduced in Ephb2−/− neurons when compared to WT neurons (Fig. 7a, b). 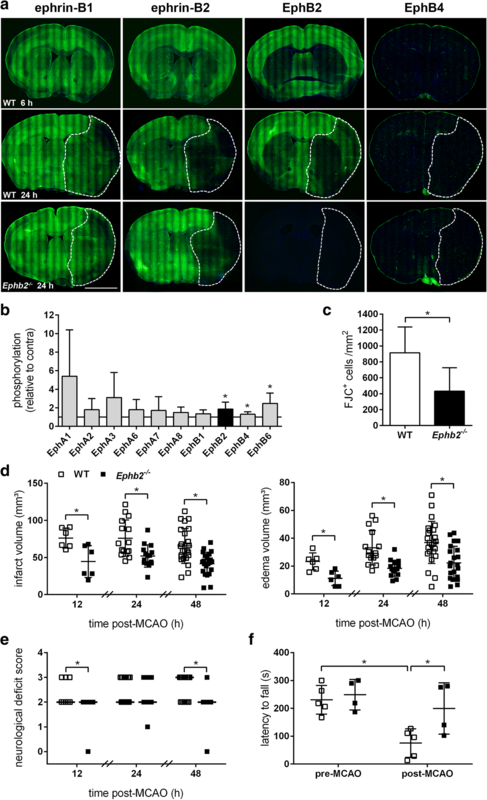 This suggests that mitochondrial Ca2+ homeostasis regulated by NMDARs is impaired already under baseline conditions when EphB2 is absent and that neurons are protected from excitotoxic mitochondrial Ca2+ overload by the lack of EphB2. As extrasynaptic NMDAR stimulation is known to promote cell death via breakdown of the mitochondrial membrane potential, the next experiments aimed at identifying whether and how the absence of EphB2 may influence mitochondrial membrane potential responses to NMDAR stimulation. Cells were loaded with the fluorescent dye Rhodamine 123 (Rh123). Exposing neurons to the mitochondrial uncoupler FCCP results in maximum fluorescence intensity of Rh123. Neurons were stimulated with NMDA and changes in Rh123 fluorescence intensity, expressed as % of the FCCP-evoked maximum, were quantified. Stimulation with low-dose NMDA did not lead to changes in Rh123 fluorescence and did not reveal any differences between the two genotypes. However, when cells were treated with high-dose NMDA, Ephb2−/− neurons showed a significantly smaller increase in Rh123 intensity when compared to WT neurons indicating that Ephb2−/− neurons are less susceptible to the NMDA-induced mitochondrial membrane depolarization that is associated with mitochondrial Ca2+ overload during an excitotoxic stimulus (Fig. 7c, d). Ca2+ imaging using the ratiometric dye fura-2 was performed to examine global cytoplasmic Ca2+ levels at baseline and during selective stimulation of NMDARs as above. Neither baseline nor NMDA-stimulated cytoplasmic Ca2+ rises were different between the two genotypes. These results indicate that NMDAR-mediated cytoplasmic Ca2+ signaling is not affected upon loss of EphB2 (Fig. 7e). 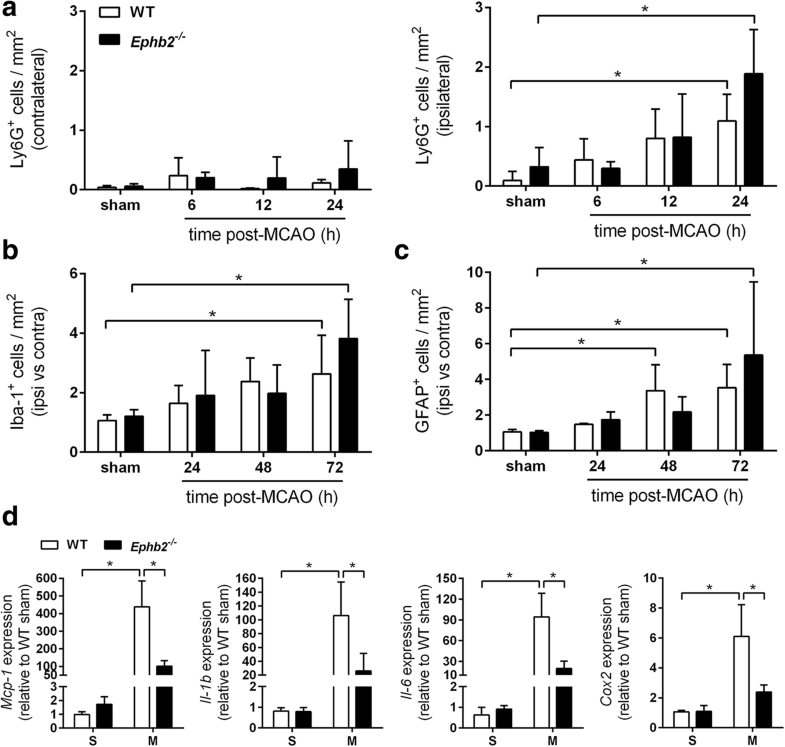 Synaptic activity can trigger a nuclear Ca2+-driven neuroprotective gene program leading to a reduction in excitotoxicity-associated mitochondrial Ca2+ load [9, 59]. Consequently, neurons are less sensitive to excitotoxic cell death and ischemia [9, 51, 58]. AP bursting was triggered by treatment with the type A gamma-aminobutyric acid receptor (GABAaR) antagonist gabazine, and cytoplasmic and mitochondrial Ca2+ responses were measured with Fura-2 and 4mt.D3cpv, respectively. The amplitudes of cytoplasmic Ca2+ responses to a single burst of APs were attenuated in Ephb2−/− neurons (Additional file 1: Figure S10a). However, mitochondrial Ca2+ rises in response to an AP burst were not different between genotypes (Additional file 1: Figure S10b, c). Taken together, our imaging data show both attenuated NMDAR-dependent mitochondrial Ca2+ signaling and diminished sensitivity of the mitochondrial membrane potential to NMDAR stimulation in Ephb2−/− neurons. These findings support the hypothesis that EphB2 deficiency protects neurons from NMDAR-induced excitotoxicity. The early phosphorylation of EphB2 (Fig. 1b) after the onset of ischemia, prompted us finally to have a closer look at its ligand ephrin-B2. Thus, we analyzed whether conditional ablation of the Efnb2 gene in cells of the neural lineage may result in a similar protection of the murine CNS from acute ischemic stroke as indicated for Ephb2−/− mice (Fig. 1c-f). 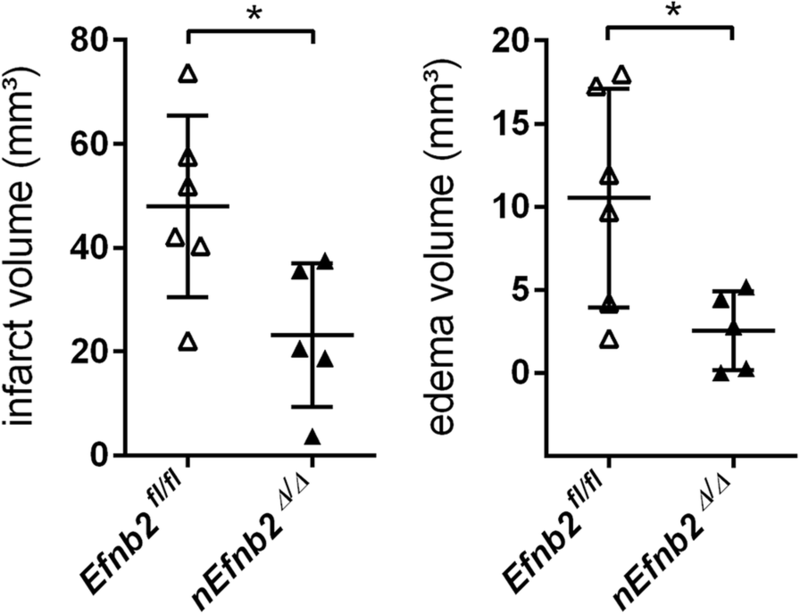 In fact, nEfnb2Δ/Δ mice showed a significantly decreased infarct lesion size and brain swelling in comparison to Efnb2fl/fl littermates (Fig. 8). Overall, our experimental data strongly suggest that glutamate-induced excitotoxic neuronal damage and inflammation during early acute ischemic stroke is substantially enhanced by EphB2/ephrin-B2 forward and reverse signaling in neurons and astrocytes, respectively. Several previous studies in rodent models of cerebral ischemia have demonstrated that EphB/ephrin-B signaling is important for the regulation of delayed endogenous adaptive processes such as neurogenesis [11, 55] and angiogenesis [14, 56], and as such promotes long-term recovery from ischemic stroke. Whether or not EphB/ephrin-B family members are also involved in acute events during the pathogenesis of stroke is, however, entirely unknown. To the best of our knowledge, we here provide the first experimental evidence that EphB2-dependent signaling is crucial for certain pathophysiological processes that are initiated in the early acute phase after ischemic stroke. The major novel findings of the present study include the following: (1) loss of EphB2 function diminishes infarct size, brain swelling and functional impairments in the early acute stage of ischemic stroke. (2) Acute inflammatory gene expression in response to cerebral ischemia is reduced in Ephb2-deficient mice. On the cellular level, EphB2/ephrin-B reverse signaling drives NF-κB- and MAPK-dependent pro-inflammatory activation of resident astrocytes. (3) The extent of cytotoxic edema developing in the infarct core within the first few hours after stroke onset was strongly decreased in Ephb2-deficient brains. Accordingly, neurons lacking EphB2 show a reduced vulnerability to mitochondrial dysfunction in the course of NMDA-induced excitotoxicity. On the mechanistic level, the observed decrease in infarct size in Ephb2-deficient mice may originate from an alteration of multiple cellular and molecular interactions as EphB/ephrin signaling may influence the function of different cell types belonging to the vascular, immune or neuronal system. In fact, with respect to the vascular unit, a putative impact of EphB2 on the cerebrovascular anatomy and functionality is deduced from studies suggesting that mesenchymal EphB2 is required to communicate with vascular endothelial ephrin-B-ligands for adequate blood vessel development . Moreover, ephrin-B2/EphB4 signaling has been shown to be involved in the restoration of the BBB and neurovascular repair mechanisms upon cerebral ischemia , underlining the importance of ephrin/Eph communication at the neurovascular interface for cellular responses to stroke. However, our study revealed that neither cerebrovascular anatomy, capillary density, and pericyte coverage, nor the reduction in rCBF upon MCAO was altered in Ephb2-deficient as compared to WT mice suggesting that loss of EphB2 does not directly affect the phenotype of vascular cells in response to cerebral ischemia. Additionally, we investigated the functional responses of the vascular unit and analyzed the development of vasogenic edema that evolves from an increase in permeability of the BBB thereby allowing extravasation of fluid into the brain parenchyma . However, as assessed by immunofluorescence-, dye extravasation-, and MRI-based analyses, vascular gap formation, BBB hyperpermeability, and vasogenic edema formation were comparable in mutant and WT mice within the first 6 h upon cerebral ischemia. Collectively, none of our findings supports a primary role of vascular EphB2 on infarct and edema formation. Another aspect of the EphB/ephrin-B system is its capacity to modulate immune responses, a feature which may provide an alternative explanation for the observed less severe stroke response of Ephb2-deficient mice. In fact, EphB6 deficient mice show an impaired T-cell function [35, 36], and ephrin-B1 and ephrin-B2 are required to retard the internalization of IL-7Rα from the T-cell surface . Furthermore, monocytes express several types of EphB receptors [5, 26, 41] and upregulate EphB2 expression upon activation [5, 45] to allow for binding of compatible ephrin-B ligands promoting the release of MCP-1 and IL-8 . Here, we show that the early (12 h) expression of prototypic mediators of I/R-associated pro-inflammatory responses such as MCP-1 or IL-6 was decreased in Ephb2-deficient mice while the infiltration of microglia/macrophages and astrocytes into the peri-infarct region was not altered. Mechanistically, especially the pro-inflammatory activation of astrocytes may be supported under these conditions by triggering an EphB2/ephrin-B reverse signaling to stimulate NF-κB-mediated cytokine expression via the MAPK pathway as evidenced by our in vitro findings. Interestingly, a recent report indicates that astrocytic ephrin-B1 reverse signaling induced by its interaction with the neuronal EphB receptor is responsible for synapse engulfment . Along these lines, it is tempting to speculate that loss of synaptic EphB2 may also affect ephrin-B1-dependent astrocyte activation after cerebral injury. However, whether the attenuated inflammatory response we observed is a direct consequence of an environment devoid of EphB2 receptors or is indirectly caused by the reduced number of neurons dying due to excitotoxicity cannot be fully elucidated based on the chosen experimental setup. Cytotoxic brain edema triggered by neuronal swelling is the main cause of mortality following cerebral ischemia . Neuronal swelling owing to ischemic stress is rapidly initiated by aberrant depolarization and entry of sodium and chloride ions, primarily caused by reduced activity of the Na+/K+ ATPase and accumulation of extracellular glutamate due to synaptic release/spillover, impairment or reversal of uptake mechanisms, and activation of voltage-dependent channels. The resultant increase of cytoplasmic sodium and chloride causes an osmotic imbalance that leads to water entry and cytotoxic edema contributing to neuronal cell death within minutes to hours upon cerebral ischemia . Our MRI studies revealed a reduced cytotoxic edema in the infarct core of Ephb2-deficient mice already 6 h after cerebral ischemia, and thus point to a potential relationship between neuronal EphB2 function and the extent of glutamate excitotoxicity during ischemic stroke. NMDARs, glutamate and voltage-gated ion channels permeable for calcium, are central for the pathological processes that underlie glutamate excitotoxicity . In addition to their synaptic localization, NMDARs are found at extrasynaptic sites. The subunit composition of the receptors within and outside synaptic contacts is similar, although, in addition to carrying the common GluN1 subunit, extrasynaptic NMDARs contain preferentially the GluN2B subunit, whereas GluN2A is the predominant subunit in synaptic NMDARs . Paradoxically, activation of synaptic NMDARs induces neuroprotective mechanisms, whereas stimulation of extrasynaptic NMDARs promotes neuronal cell death. This difference results from the activation of distinct genomic programs and from opposing actions on intracellular signaling pathways [2, 19, 20]. Thus, any shift in balance to reduce synaptic or enhance extrasynaptic NMDAR signaling may be detrimental to neuronal viability . Calcium overload-induced mitochondrial dysfunction is a central component in the glutamate-evoked excitotoxic injury of CNS neurons . It is noteworthy to mention that extrasynaptic NMDARs may be in close contact with mitochondria, whereas the postsynaptic scaffold, and also the spine structure as such, keeps mitochondria at a distance to synaptic NMDARs . Thus, upon stimulation of extrasynaptic, but not synaptic NMDA receptors, mitochondria are exposed to high and possibly damaging calcium rises . Interestingly, several previous studies clearly demonstrated that EphB2 controls the assembly, localization and activity of NMDARs in neurons. On a mechanistic level, the ephrin-B-induced phosphorylation of a single tyrosine (Y504) in the extracellular domain of EphB2 leads to direct recruitment of NR1 and its associated subunits NR2A and NR2B to EphB2 [8, 16, 17]. Along with binding and clustering of NMDARs, ephrin-B2-mediated activation of EphB2 also enhances glutamate-stimulated Ca2+ influx through the NMDAR . The latter requires the cytoplasmic tyrosine kinase domain of EphB2 recruiting and activating Src family members, which in turn phosphorylate NR2B at Y1472, which itself is of crucial importance for the synaptic localization and retention of NMDARs [38, 50]. Thus, it is tempting to speculate that neuronal EphB2 may be a positive regulator of extrasynaptic NMDARs. In fact, our own work revealed that loss of EphB2 in post-natal neurons selectively diminished mitochondrial Ca2+ load upon activation of NMDAR but not in response to AP bursting. On the molecular level, excessive Ca2+ influx into mitochondria decreases the electrochemical gradient across the mitochondrial membrane leading to reduced ATP synthesis, release of pro-apoptotic proteins, activation of calcium-dependent proteases and elevated ROS production . 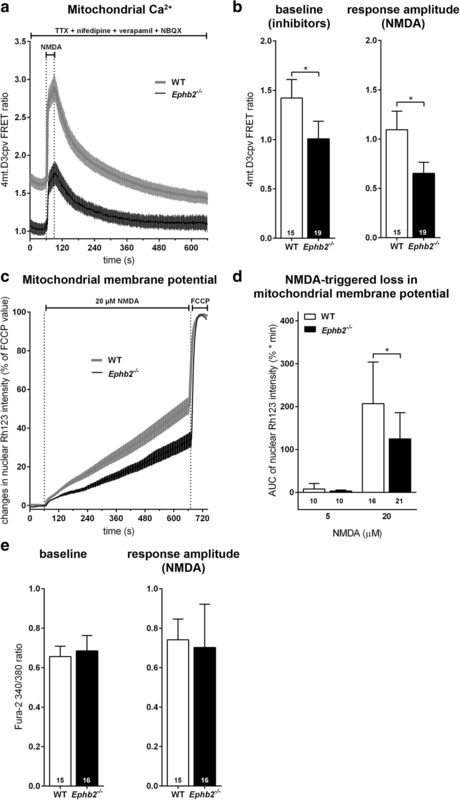 Consistent with the inhibition of mitochondrial Ca2+ overload, which triggers mitochondrial dysfunction during glutamate excitotoxicity, mitochondrial membrane depolarization was less distinct in Ephb2-deficient neurons in comparison to WT neurons stimulated with NMDA. Along this line, we showed for the first time that EphB2 is rapidly activated in the CNS of mice suffering from cerebral ischemia. Moreover, brain-specific loss of ephrin-B2 in mice reduced the extent of cerebral tissue damage in the acute phase of ischemic stroke. Taken together, our experimental data indicate that EphB2 signaling (i) contributes to the excitotoxic NMDAR-dependent Ca2+ overload of mitochondria and subsequent mitochondrial membrane depolarization and cell death in neurons, and (ii) promotes the pro-inflammatory activation of astrocytes. These findings indicate an important role of the EphB/ephrin-B system during acute ischemic stroke. Further, our results suggest that inhibition of EphB2 may specifically attenuate extrasynaptic NMDAR function, and thereby improve stroke outcome. Although NMDAR-mediated excitotoxicity is a central feature of neuronal cell death in stroke as well as in other neurodegenerative diseases, NMDARs are also important for cell survival and plasticity . Recent data suggest that this dual role for neuronal survival and death depends on the subcellular localization and subunit composition of NMDARs [2, 54]. Although all clinical trials aimed at blockade of NMDAR function to treat stroke patients failed, new hope comes from studies focusing on death-signaling pathways downstream from extrasynaptic NMDARs . As a new therapeutic approach, we here suggest to specifically attenuate detrimental extrasynaptic NMDAR activity by inhibition of the EphB/ephrin-B system. This approach might shift the balance towards pro-survival signals mediated through synaptic NMDAR-induced processes . Anne-Sophie Ernst and Laura-Inés Böhler, as well as Thomas Korff and Reiner Kunze contributed equally to this work. The expert technical assistance of Maria Harlacher, Inge Keller, Nadine Heselmaier and Manuel Fischer is gratefully acknowledged. The authors would like to thank Dr. Rüdiger Klein (Martinsried, Germany) and Dr. Carmen Ruiz de Almodóvar (Heidelberg, Germany) for providing Ephb2+/-, Efnb2fl/fl, and Nestin:Cre mice, respectively. ASE and LIB are members of the Heidelberg Biosciences International Graduate School (HBIGS, Heidelberg University). We acknowledge financial support by Deutsche Forschungsgemeinschaft within the funding programme Open Access Publishing, by the Baden-Württemberg Ministry of Science, Research and the Arts and by Ruprecht-Karls-Universität Heidelberg. This work was supported by grants from the Deutsche Forschungsgemeinschaft (Grant No. MA 2240/5–2 (HHM), Grant No. KO 2344/5–2 (TK), and Collaborative Research Center Grant 1158, project A05 (HB)), and also by the German-Israeli Project Cooperation (DIP) BA1007/7–1 (HB). AH is supported by the Olympia-Morata Fellowship of the Medical Faculty Heidelberg. HHM, TK and RK conceived and directed the study. ASE, LB, AMH, AH, SH, MB, MH, HB, HHM, TK and RK conceived and designed the experiments. ASE, LB, AMH, AH, CS and RK performed the experiments and analyzed the data. HHM, TK and RK wrote the manuscript with input from all authors. All authors read and approved the final manuscript. All animal experiments were approved by the local animal welfare committee (Regierungspräsidium Karlsruhe, Germany, permission number: 35–9185.81/G-112/13).